Hakone: Still digging progresses Hakone 7 hot spring and now at the Edo period, it is also called 19 hot springs from 17 hot springs centering on the foot of a volcanic-fumes emit Mt.Kanmuri-dake, and Owakudani, and an inn is also an enough hot spring resort near Sengen.A Mt.Kanmuri-dake, Kamiyama, and Mt. Komagatake were formed, the river was dammed up by pre- explosion as 3 Chitoshi, and the volcanic activity which started in front of about 50 Mannen made the crater lake (Ashinoko). 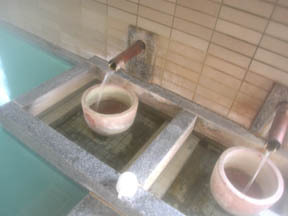 Ashinoyu: It is a hot spring which wells ups at the ravine by the side of opposite, and a quiet place across a Mt.Kanmuri-dake, Kamiyama, and Mt. 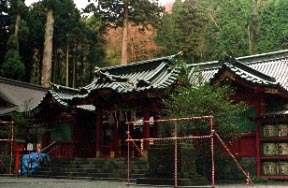 Komagatake from Owakudani.The maximum height spot of Hakone ekiden is located in one of having been called the Edo period and Hakone 7 hot spring, and the neighborhood, and it is blessed also with places of natural beauty and historic interest, such as the old highway stone pavement, a cedar avenue, the Hakone barrier, the Hakone shrine, and Ashinoko, if that is passed. 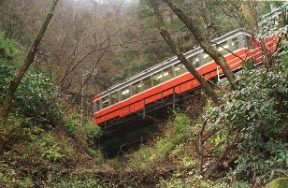 A mountain railway and Hakone are vehicle Heaven. * Alkalescence is called this one in Japan by the sulfur spring of the volcanic system which hydrogen sulfide odor carries out. A skin disorder, neuralgia, women's diseases, rheumatism, a gastroenteric pain, etc. East Ashinoyu alighting, on foot 2 minutes.